Starting and maintaining a new business comes with many setbacks. Failure is inevitable. How we deal with this failure can condition us for how we approach our future goals. It’s a feedback cycle that can sometimes go awry if not examined carefully. In particular, experiencing failure can cause the psychological response called learned helplessness. Because helplessness is a learned behavior, there are ways it can be unlearned. Learned helplessness is a mental state where someone who is forced to bear repeated adverse situations, becomes unable or unwilling to avoid these situations. This happens because past experiences have made them believe they don’t have the ability to avoid them. Essentially, they’ve trained themselves (and their brain) to believe they have no control over the situation, and so they don’t even try. 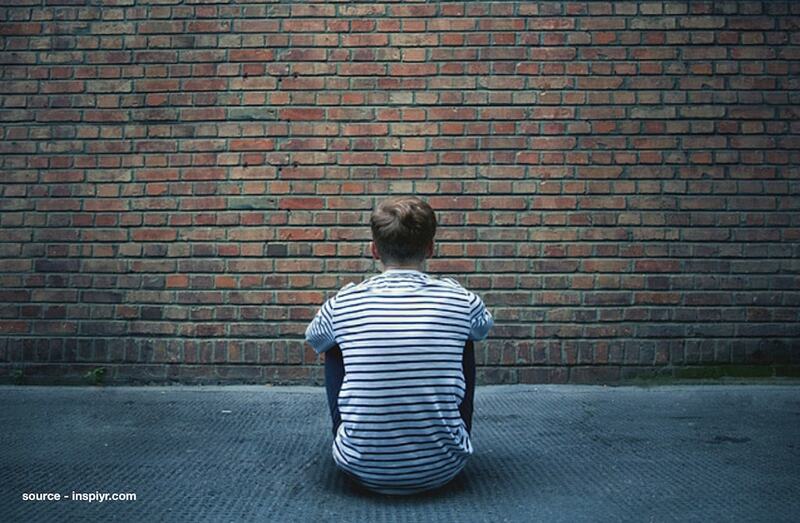 Filling our minds with limiting beliefs of what we’re able to achieve (or not) is dangerous. It generates a cycle of self-defeatist thinking. And when caught in the middle of this cycle, your motivation and overall productivity will inevitably start to suffer. By the end of this article, you will have a better understanding of the common ways your brain deals with failure and the tools to unlearn these adverse behaviours. As always, our team of psychology and neuroscience PhDs have gone through a vast number of scientific papers and research so that you can have the utmost confidence in all our recommendations. The question is, what goes on in the mind/brain during states of learned helplessness? And more important, how do you overcome it? Learned helplessness results from negative conditioned learning. It’s mostly unconscious. By experiencing the “helpless” feelings of negativity, you become more likely to “learn” that you shouldn’t try new things for fear of failure or rejection. And with enough of these experiences, the adoption of these defeatist attitudes becomes highly problematic. Scientists have documented the causes and effects of learned helplessness. It all begins with some dogs and a few mild shocks. 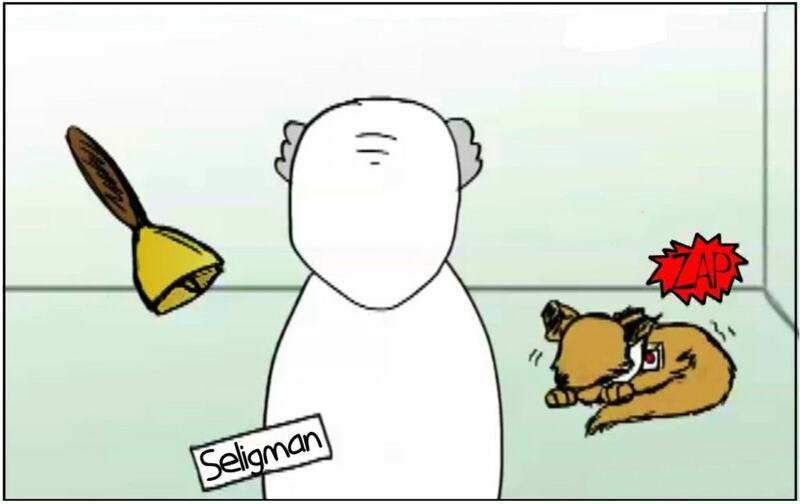 In a famous experiment in 1965, Dr. Martin Seligman conditioned dogs so that every time they heard the ring of a bell they would receive (and in time expect) a mild shock. I know, not the nicest way to treat our best pals, but this study was done a long time ago! After they were conditioned, Seligman put the dogs in a large crate with a low fence dividing the two sides. One side was wired with the slight shocks. The other wasn’t. They figured that if they rang the bell, the dog would hop over the fence to escape the mild shock and go to the safe side. But the dogs stayed put. They laid down and took the shock. You see, the dogs were conditioned to learn from the previous experience that there was nothing they could do to avoid the shocks. 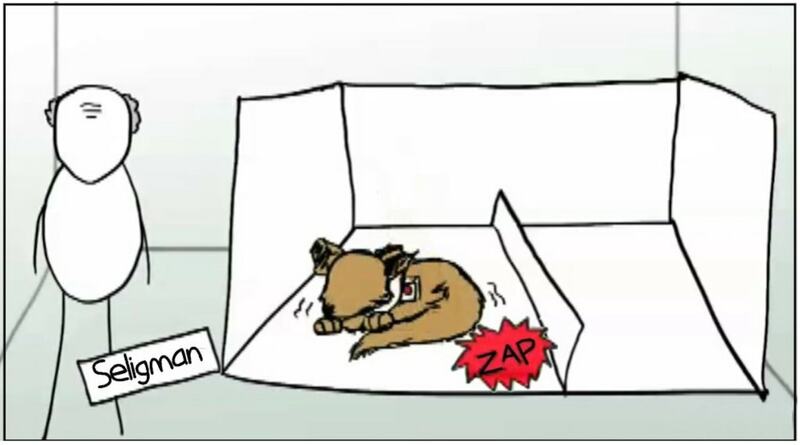 Seligman attributed this helpless behavior as something that was learned after repeated failure, because when they had done the same test to another dog who had NOT been shocked before, the dog easily jumped over the barrier. And as it turns out, we humans are not so different from dogs. At the root of it, learned helplessness is a form of conditioning. Conditioning is based on the idea that human behavior is learned via associations and responses in the environment. Simply put: If something is reinforced/rewarded, we are more likely to repeat that behavior again. And likewise, if we are punished, we’re more likely to avoid that same behavior in the future. Unlearning this association and deconditioning the response takes just a little bit of practice. In the sections that follow we’ll focus on how to reverse this way of thinking/behaving so that you can grow positively and be motivated in taking risks and trying new things out. You need to first identify your characteristic explanatory style. This refers to how you explain the events that happen in your day to day. The patterns of this are tightly linked to learned helplessness. 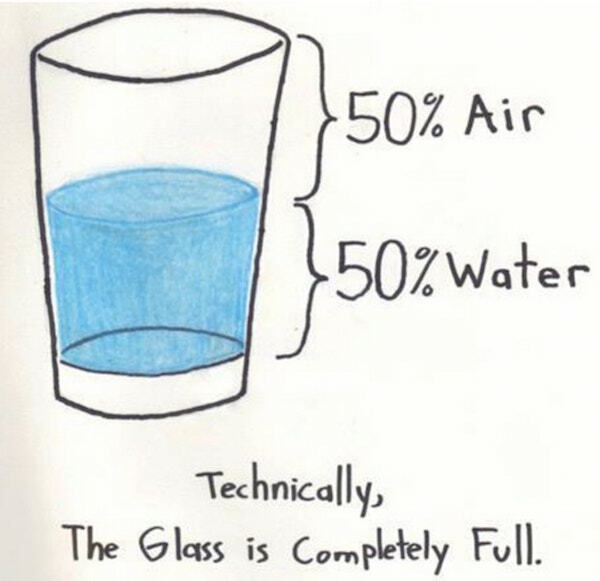 It all comes down to differences in optimism vs. pessimism. First, take this survey adapted from Dr. Seligman’s book, Learned Optimism. This will tell you your baseline explanatory style. Don’t read on until you’ve finished the survey and gotten your results. We’ll explain what they mean below. Before diving into your results though, we’ll walk through the different features of the assessment. The main goal in unlearning learned helplessness is to adopt a more optimistic explanatory style. This is how we explain the context of an event; whether the situation is consistent across all environments or specific to one environment. For example, “I don’t enjoy meeting people at meet-ups” (global), as opposed to “I didn’t really enjoy chatting with the people at the last meet-up we went to” (specific). Personalization bad score: Optimistic score here means you blame bad events on external causes rather than continuously blaming yourself. Personalization good score: Optimistic score here means you internalize positive events instead of externalizing them. Permanence bad score: Optimistic score here indicates that you view bad events as temporary and tend to bounce back quickly from failure. Permanence good score: Optimistic score here means you believe that good events are permanent and happen for a reason. The total bad score will give you an idea of how you look at bad events in life (whether from an optimistic or pessimistic point of view). The total good score will give you an idea of how you look at good events in your life. And finally, the good minus bad score is the total difference score summary statistic of your baseline explanatory style. This baseline will help you figure out which of the three attribution styles you should work on in order to view events more positively. Each time you find yourself trying to make sense of a situation, take a close look at the patterns of your explanation. Aim for those that are rooted in optimism, not pessimism. When faced with disappointment or any sort of negativity, you can begin to change your helpless and pessimistic perspective by using the ABC method developed by Dr. Albert Ellis and Dr. Martin Seligman. This method allows a more flexible response to negativity and is the perfect next-step antidote to the defeatist mindset of learned helplessness. Describe the event that happened. Here leave out any evaluations or judgments. Simply put a description to the event that happened in a way that’s as unemotional as possible. Explain how adversity was interpreted. Not how you think it ought to be, but what your default belief/interpretation was. Think about the feelings and actions that result from these beliefs. Go back with a level of introspection and ask yourself how you handled things. Dig deep. How and when do those emotions/feeling lead to certain behaviors and actions. Do you have any grounds to dispute these automatic reactions? What are the possible repercussions of following through on those emotions? Think about whether there are greater benefits to moving on from the situation and stopping that baseline (often impulsive) response in its tracks. This is the last step that’s done when successful disputation occurs. Did you manage to turn things around? Put all your focus on the positive feelings that ensued as a result of reframing your thoughts, emotions, and behaviors. Ask yourself, what’s different between how I just handled this situation versus how I would normally handle it? Relish in those personal rewards. The regular application of this method will get you into the habitual groove of optimistic responding. Here are some different techniques for altering your perspective (to overcome anxiety specifically). It will get you out of the damaging pattern of pessimism. In a short time you’ll notice a natural reframing in response to negative situations. Positivity is a key step to unlearning learned helplessness. Now that we have figured out how to find our attribution style and how to overcome pessimistic thinking, the third and final method is to understand a basic principle of self-hood: That you are in control. Psychological research has shown that a belief that failure is beyond your control or that a situation is unlikely to change, is associated with worse performance and lower self-efficacy. One way you can accomplish this is through active goal setting. Goal setting has been shown to increase behavior change as it increases your desire to act in a particular way (motivation). Setting reasonable goals that are likely to be achieved, will provide the sense of control over your outcomes – especially as you begin to meet those goals on a consistent basis. 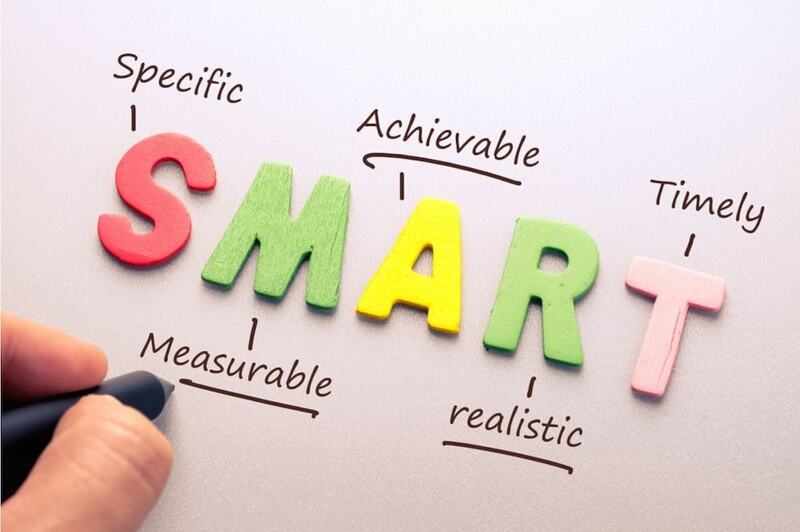 A highly actionable way of organizing your goal-setting is through the S.M.A.R.T method. It’s important to be completely aware of what it is you want to achieve. For example, if your goal is to have your company start bringing in revenue this year you would ask yourself what exactly this means to you (and/or your team). Remember, you want the goal to be as clear as possible. What is it exactly that I want to achieve? List concrete, tangible outcomes. Where is this going to happen? Give names, locations, offices, cities, etc. When am I going to make this happen? Give specific dates and timelines. Work backwards. Who is going to be involved? Give names and team members as well as potential partners and others to lean on. How am I going to make this happen? With all the information above, lay out a detailed strategy, tactic, and plan. Why do I want to reach this goal? Tie it into your bigger vision for yourself and your business. These relate to your principles, values, missions – the things that you stay true to. Making sure your goal is measurable is important for determining how you will track your progress. The brain prefers this in gaining a sense of control. Help refine exactly what it is you want. Important! This is where many people go wrong with goal setting. Micro goal-setting, as it’s called, improves the likelihood that each stage will be accomplished. This is an important one. Is your goal achievable and realistic? If it’s not, you’re just going to get stuck in the same learned helplessness cycle because of the likelihood of failure. Is the sales target you made (from above example) achievable? What will happen to your business if you fall short of this goal? Consider any constraints or obstacles you may face and whether you’ll be able to overcome them. This is where you sit and determine how relevant the goal is to you. Will it be fulfilling towards you as an individual? This is where you’re going to come back to the “why?” question. Why is earning $8K in monthly recurring revenue really important for you and your company this year? At this step, it is also important to figure out how your goals fit with your other plans and things set for your life. Maybe getting up to that $8K /month earning will require you to put in 12 hour days so you won’t have time to work on your other hobbies/things that make you happy. Are you going to be ok with that? Are there certain steps you can be taking right now that can help your long-term goal to be achieved? What should you get done over the next week to contribute to your goal? What should you get done over the next month to contribute to your goal? We recommend pairing the S.M.A.R.T method with any of the handy goal-setting apps available out there. One program that’s particularly good, called Stickk, incorporates personalized nudges to assist in goal-setting, such as donating to an anti-charity (where you give money to a cause you strongly dislike if you fail to hit the goal) or involving a friend to hold you accountable. How can we unlearn this behaviour? Make sure goal-setting is Specific, Measurable, Achievable, Relevant, and Timed. Implement these actions throughout your day to keep track of potential learned helplessness behavior. As an entrepreneur we deal with many repeated failures. Don’t fall into the learned helplessness mindset.